The fact that you know you need to engage with your presentation audience isn’t your problem. No, the challenge is to know how to engage with your presentation audience. Because, the fact is you need to build presentation participation with your audience. So, these three prove to be most effective for boosting audience participation. That’s because they are firstly simple for you to use and, second, your audience recognises them. And, importantly, they respond to them. They are well worth trying. Maintain eye contact. When you look into the eyes of an audience member you strike up a one to one relationship. Then, hold their attention as you complete your point. Pause whilst maintaining eye contact. Then, wait for a reaction from your audience member. It’s typically a nod. And then move your focus to someone else. It works. Ask a question. A well-timed rhetorical question is also an effective way to engage with your audience. Asking a question calls for a reaction…your reaction. It’s a simple technique. Just ask an open question (beginning with, how, what, when etc), pause and then answer the question. The same rhetorical question is equally good as a structure signal for your audience. Repeat the question two or three times as you raise your left hand. And then you ask, “how many of you support plan B? Raise you hand.” (This might not work at a Mark’s and Spencer’s conference). Repeat this question two or three times with your right hand in the air. Assess the results for each question as you proceed. Then, feed the results back to your presentation audience. This stage is critical. Because your objective is participation…so your audience will value their participation when they know what they’ve just done or achieved. 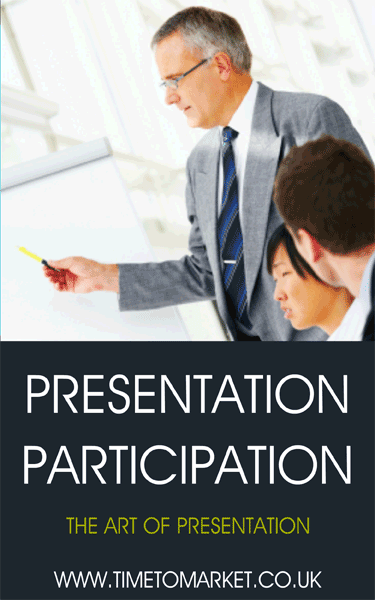 These are three easy ways for you to build some participation into your presentation audience. Easy and simple, and they also work. Of course, there are other techniques such as this dance presentation by the TED presenter John Bohannon. But that’s going to take some budget! You can learn more skills and techniques when you join a public presentation training course or organise your own corporate training day. And because we run courses at more than 40 training centres in the UK, you are never that far away.